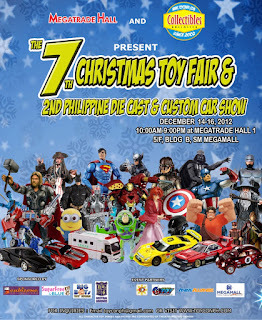 The 7th Christmas Toy Fair plus the 2nd Philippine Die cast and Custom Car Show starts December 14 up until December 16, 2012 at the SM Megatrade Hall 1, SM Megamall. Do your shopping and get the best toys, comics, anime, video games and collectibles at the Toy Fair. Proceeds will go to the Philippine Toy Museum, the 7th beneficiary of this Christmas Toy Fair. Entrance fee is only 60 pesos. Stage games, raffles and more! The Christmas Cosplay parade will be held on Saturday. Registration starts at 10AM and assembly follows at 1PM. The parade will start at 2PM, Atrium Ground Floor. Special prize will be given to the best Christmas cosplay theme character. 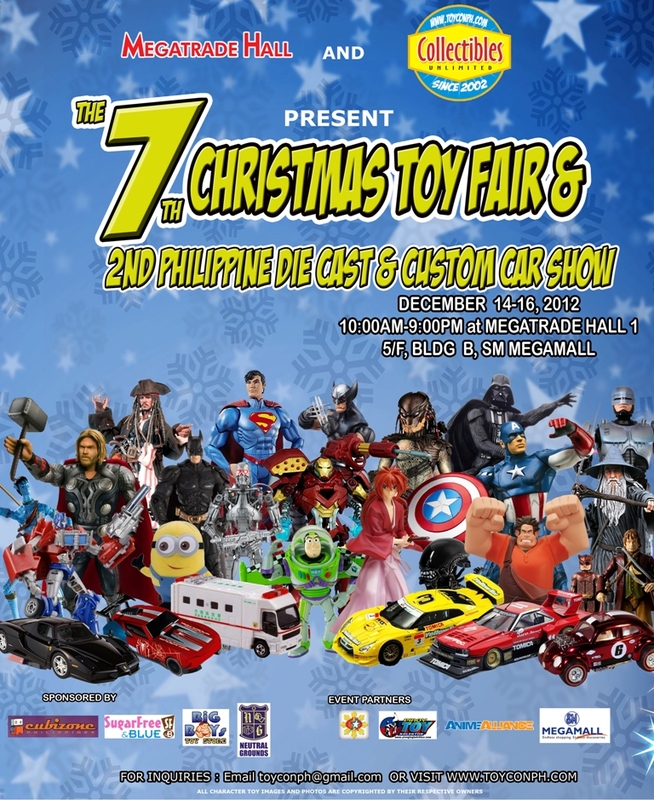 The 2nd Philippine Diecast and custom car show will have some activities like auctions, panel talks about diecast cars collecting, special raffle and diecast cars custom contest. Come and visit this Friday and Saturday for the toy donation drive of the Philippine Toy Library (PTL). PTL welcomes donations of old toys and children’s books to build a toy library for Sendong Survivors in Cagayan de Oro.